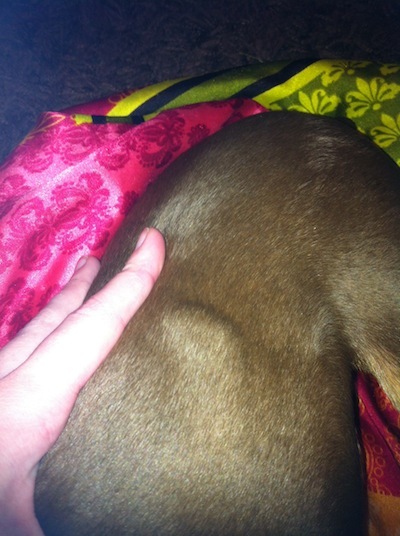 Large lump on dog's side. A lump (about the size of a quarter) showed up suddenly on his side, about an inch down from his back bone. It's hard, and doesnt hurt him when pressed, nor has he been acting differently. He had a short stay at the vet about a month ago (for a stomach virus). But other than that there has been no changes in his daily life. Should I take him to the vet to get checked out, or just keep an eye on it? Now, keep in mind that I can't give you a diagnosis over the internet. This could be a few things. Given that Jax was recently at the vet's, there is a possibility that this is a reaction to an injection. If he had a stomach virus he may have been given an anti-nausea injection such as cerenia. An injection can sometimes cause a mild reaction causing something called a granuloma to form. If this is the case then it's probably nothing to worry about. Or, it's possible that this is an injection induced abscess. While you would expect an abscess to be painful, they aren't always. If Jax was a bigger dog like a lab or Golden Retriever then I would be saying that this could be a fat lump called a lipoma. These are nothing to worry about. But they don't usually pop up that suddenly. It's also possible that this is a seroma which is a kind of a fluid filled bruise. There are other more serious things that this could be such as a mast cell tumor or other types of cancer. I think the chances of this being cancerous are small, but it's still possible. I do think that this is something I would get checked out. I wouldn't rush in today but I think if it is not reducing in size within a week or so I would have the vet check it. They will likely put a needle in and draw some cells out. I'm not too worried about this, but I can tell you that it is not something I would call "normal". I hope everything works out ok!